Forever tied to his popular adaptation of S.E. Hinton's 1967 novel The Outsiders, Francis Ford Coppola's Rumble Fish (1983) offers a distinctly personal take on another book by the same author. Developed simultaneously and released just six months after The Outsiders hit theaters, Coppola was attracted to the prospect of creating a full-on "art film for teenagers": one pairing crisp black-and-white cinematography and stylish editing with the angst of restless gang life in Tulsa, Oklahoma. It's an interesting experiment that was almost doomed to commercial failure, further crippling the popular momentum of a director known for his massive success the previous decade. But time---and the name value of its primary cast---has caused Rumble Fish's stock to rise during the last 34 years. 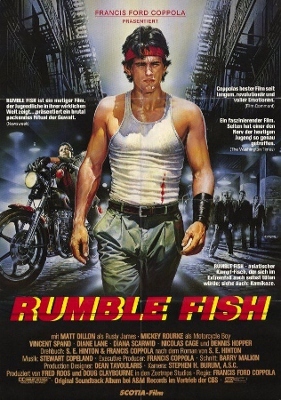 Now viewed primarily as the "antidote" to The Outsiders' more candy-colored and accessible world, Rumble Fish is highlighted by standout performances, percussion-heavy music by The Police drummer Stewart Copeland (his first of 18 film scores, and one of them is for Good Burger), and a striking appearance that absolutely drips with emotion from start to finish. Our entry point is Rusty-James (Matt Dillon), a young delinquent with gang ties and a love for bare-knuckle brawls. He's surprised to learn that older brother "Motorcycle Boy" (Mickey Rourke) has returned from a recent trip to California as an entirely new man: Motorcycle Boy is no longer interested in gang warfare, nor does he want to follow in the footsteps of their alcoholic father (Dennis Hopper) or absentee mother. From the first scene onward, it's obvious that most of the characters in Rumble Fish are broken and almost destined for tragedy. Rusty-James is abusive towards his girlfriend Patty (Diane Lane), has completely checked out of school, and it seems like the only joy he gets in life is stirring the pot with fellow gang members Steve (Vincent Spano), Smokey (Nicolas Cage), and B.J. (Chris Penn) at a billiard hall owned by gum-chewing Benny (Tom Waits). But he obviously idolizes his older brother, and it's their second-act trip with Steve across the nearby Arkansas River that gives them time to share their thoughts with one another...especially once Steve and Rusty-James are brutally beaten by thugs in a back alley. Yet the brothers' intensely different outlooks on life---and the potential insanity of Motorcycle Boy, like their mother---may be too deeply separated for any result but an unhappy ending. 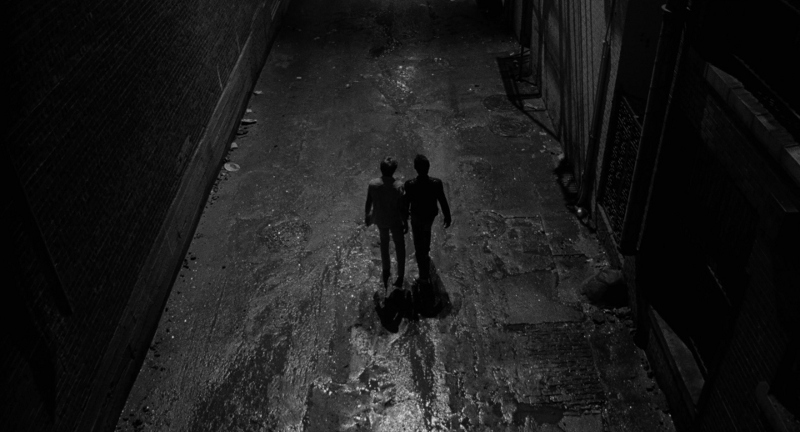 Rumble Fish is a challenging and at times aimless film; like its main characters, certain segments seem to wallow in emotion and struggle to move forward. But its intensely personal nature and stunning visuals will hold the attention of any viewer willing to go along for the ride, especially fans of the cast (many returning from The Outsiders) who turn in universally strong performances early in their respective careers. Criterion's new Blu-ray package easily exceeds Universal's well-regarded 2005 DVD in every department, serving up an outstanding new 4K-sourced transfer, multiple audio options, and a rock-solid assortment of new and vintage bonus features. Though new viewers may want to try before they buy, this Blu-ray is an extremely safe bet for established fans of Coppola's film. 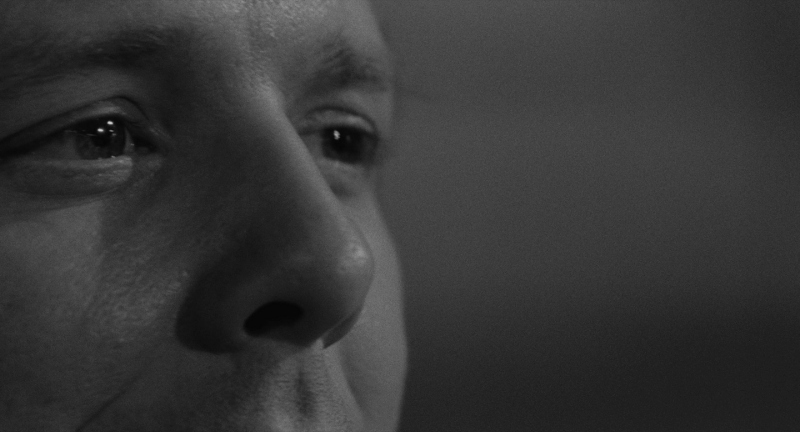 Presented in its original 1.85:1 aspect ratio, Rumble Fish looks beautifully dark on Criterion's new Blu-ray. I don't have Universal's 2005 DVD on hand for a comparison, but this obviously represents a huge improvement over anything standard definition can offer: rich textures, strong image detail, and excellent contrast levels, just for starters. Shadows play a big part in Rumble Fish: they're prominently featured, and their effectiveness is increased a great deal on a transfer of this quality. Sourced from a new 4K restoration supervised by cinematographer Stephen H. Burum and approved by director Francis Ford Coppola, this strong and stable image does not suffer from any defects such as excessive noise reduction, edge enhancement, or compression artifacts. Fans will be pleased for sure. Not to be outdone, the original DTS-HD Master Audio 2.0 mix sounds terrific...as well as an alternate DTS-HD Master Audio 5.1 surround remix, both of which I sampled for different scenes during my viewing. There's a lot going on at times during Rumble Fish, and I'll be honest in my judgment that the 5.1 remix is more subtly effective when the situation demands it: bustling atmospheres, background music, Stewart Copeland's original score, and Motorcycle Boy's partial deafness all sound much more dynamic and engaging with the addition of this surround boost, although purists will appreciate the stereo option. Either way, the dialogue is crisp and clear, nicely balanced with no obvious distortion or other defects. Optional English subtitles are included during the main feature only. As usual, Criterion's menu is smooth and easy to navigate. The disc is locked for Region A players only; it's packaged in Criterion's stocky keepcase with attractive double-sided artwork. The fold-out Poster Insert includes a new essay by critic Glenn Kenny, technical specs, and a memorable film-themed image on the reverse side. New to this release are several exclusive supplements, mostly in the form of recent Interviews. These lead off with separate chats featuring Francis Ford Coppola (19:16), author and co-screenwriter S. E. Hinton (17:57), associate producer Roman Coppola (7:59), actors Matt Dillon and Diane Lane (21:09), production designer Dean Tavoularis (30:41), and associate producer Roman Coppola (7:59). There's a lot of great retrospective information here, more than a few vintage photos, and even a few miscellaneous clips of rehearsal and test footage. Several odds and ends---new to home video, at least in Region A territory---are here as well. "Camus for Kids" (20:33) is a new piece about Rumble Fish's existentialist elements by film historian Rodney F. Hill, co-editor of Francis Ford Coppola: Interviews. Locations: Looking for Rusty James (1:29:28) is a 2013 documentary by filmmaker Alberto Fuguet about the impact of Rumble Fish on his own life and his peers in native Chile. Two vintage 1983 Interviews are here as well: one features actors Matt Dillon and Diane Lane (21:09), the other has actor Vincent Spano and producer Doug Claybourne (8:57). Finally, we get a 1984 French TV Interview with actor Mickey Rourke (8:46), as well as a collection of six Deleted Scenes ("Face the Fact", "Is Your Mother Dying? ", "Stealing Hubcaps", "Feelings and Ideas", "Write the End", and "Princess of Troy") with a new introduction by Coppola (23 minutes total). Many of these are minor character moments and more than half include Vincent Spano's character "Steve"; they're taken from a pretty rough videotaped source, but fans will be thrilled to have these in any condition. Carried over from Universal's 2005 DVD are a candid Audio Commentary with Francis Ford Coppola, two Behind-the-Scenes Featurettes ("On Location in Tulsa" and "The Percussion-Based Score", 24 minutes total), a Music Video for Stan Ridgway's "Don't Box Me In" (3:36), and the film's Theatrical Trailer (2:15) which still looks pretty rough. Forced English subtitles are included during a few foreign-language supplements, but for translation only. 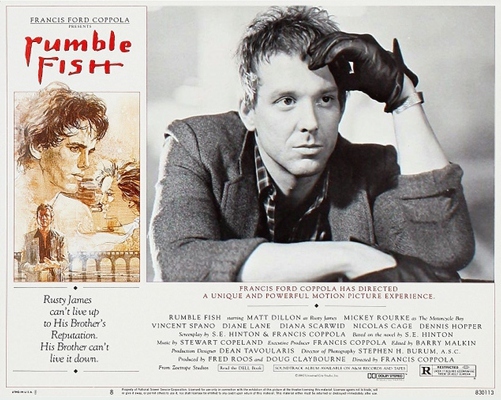 Director Francis Ford Coppola approached his 1983 film Rumble Fish as a palate cleanser after the more colorful world of The Outsiders, released only six months earlier. Both are sourced from S.E. Hinton novels about gang life in Tulsa, Oklahoma, with terrific young casts and no shortage of drama and angst. Rumble Fish was almost doomed to under-perform with its black-and-white cinematography and coarser subject matter, but it's only grown in stature as the decades have passed. It's a film that wanders a lot more than it should at times, but Criterion's Blu-ray absolutely knocks one out of the park with a flawless new 4K-sourced transfer, multiple audio options, and a wealth of new and old bonus features that elevate the experience dramatically. Highly Recommended.